Why can’t I just cut a hole in my glass door and install a pet door? In order to install a pet door through a window or a glass door, the pane must be replaced. 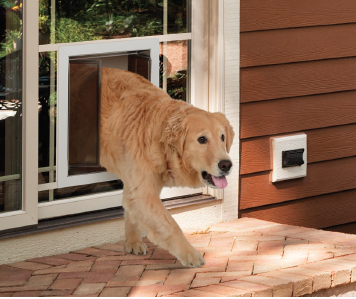 Many pet doors are available for installation on glass. You would need to order a new pane with the right sized hole already cut. There is also a new PlexiDor Glass Series that comes as a prefabricated glass unit with a factory installed PlexiDor dog door or cat door. There are sizes available to fit most sliding glass door frames.